AUSTRALIA, diciembre 22, 2005.- Cientos de huellas humanas de hace por lo menos 20 mil años fueron descubiertas en Nueva Gales del Sur, en Australia, por parte de arqueólogos. 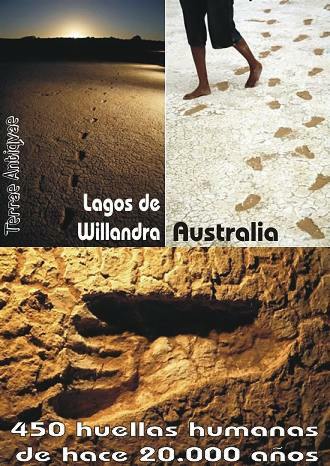 Se trata de 450 huellas, las que corresponden a niños y adultos que caminaron sobre una zona de arcilla húmeda en plena era glaciar, en lo que ahora se conoce como Área de Herencia Mundial en los Lagos de Willandra. Otras huellas muestran a grupos de niños y adultos caminando juntos. Los científicos dicen que la perfecta preservación de las huellas podría ser el más antiguo hallazgo en Australia y el mayor en todo el mundo. Professor Webb said the find provided a unique glimpse into the lives of those who lived in the arid inland. "It brings these people to life in a way no other archaeological evidence can. You can see how the mud squelched between their toes." The traditional custodians of the area, members of the Willandra Lakes Region World Heritage Area Three Traditional Tribal Groups Elders Corporation, said they were very excited by the find. Ms Pappin, a Mutthi Mutthi elder, said walking alongside the footprints was like "walking with a family group today. They're the same people". She believed the prints had been revealed from under the sand dunes "to let the rest of the world know how clever our people really were, living and surviving in their environment". Roy Kennedy, a Ngiyampaa elder, said the area had been a special meeting place for his tribe since the Dreamtime. "It was an oasis in the desert." About 20,000 years ago the now dry lakes would have contained fish, mussels and crayfish. The team estimated the height of the people from their foot size, and their speed from the distance between paces. Professor Webb has also recently excavated two 17,000-year-old skeletal remains found about six kilometres away. "They were athletic and very strong and fit. I assume some of the men on this site were very similar," he said. Dave Johnston, chairman of the elders corporation, said the site was closed to the public to preserve it, and the elders were developing a management, conservation and tourism plan. The team, including Matthew Cupper of the University of Melbourne and Richard Robins of the University of New England, have published results on 124 footprints online ahead of print publication in the Journal of Human Evolution. * 457 footprints, made by adults and children, found in Mungo National Park. * Footprints 19,000-23,000 years old. * Laid down in wet clay containing calcium carbonate that hardened like concrete, then covered in a layer of protective clay and sand. * Prints between 13cm and 30cm (size 11) in length. * One track of a man almost two metres tall running at 20kmh. Me resulta chocante que en este artículo, que es de 2005, se dé a entender que hasta ahora los restos más antiguos de presencia "humana" en Europa databan de hace 500.000 años; ¿qué pasa con los restos de Homo antecessor de Atapuerca, hallados en 1997 y que datan de hace 800.000 años?